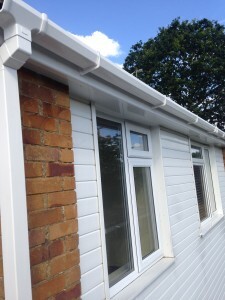 We install new Gutters, Fascias and Soffits on all range of properties, from small domestic garages and sheds right through to large commercial premises, and everything in between. Hundreds of colours and styles are available nowadays and we can take you through the creative process to suit your needs. Whether its a leaking join, a blocked downpipe or moss and debris clogging up your gutter, if you have a problem with your rainwater system we can fix it. We can also install ‘Hedgehog’ gutter guards, which are essentially cylindrical brushes that sit inside the gutters to protect from leaves and moss clogging up your drainage system whilst still allowing rainwater to pass. Having a regular, well maintained rain water drainage system also prevents costly repairs bills in the future. We will carry out a no obligation quote where we assess what’s wrong and always stick to the prices quoted, so there’s surprises when it comes to the bill. Honest, straightforward and never any hard sell tactics, we let our customer service speak for itself. Using specialist telescopic jet washing equipment and soft flock brushes we can totally transform the look of your Fascias, Soffits and Guttering which in turn makes a big difference to your home.